The Osher Learning Center on 50 Overlook Terrace gives parents a tuition break in exchange for part-time work in the classroom. 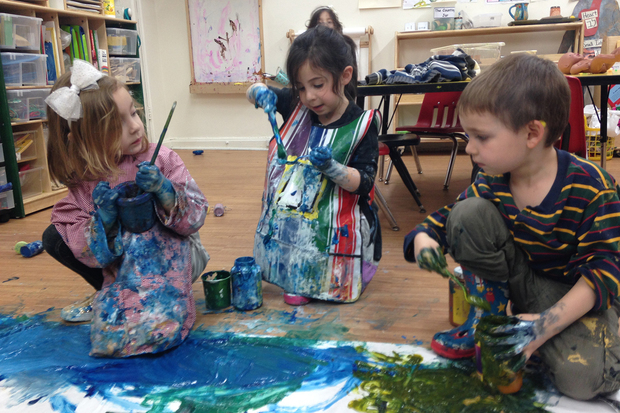 HUDSON HEIGHTS — A local preschool’s work-study grant program lets parents barter their skills for a preschool tuition break, making the process of going back to work a lot easier and more affordable, its director says. When the Osher Learning Center on 50 Overlook Terrace opened in 2011, the goal was to provide an affordable and nurturing educational environment, where kids learned everything from music, science and art in a "homeschool setting," said director Elisheva Kirschenbaum. Kirschenbaum said she started Osher, which means joy, rich and wealth in Hebrew, to help parents find a balance between working, supporting their kids and being a part of a community. Kirschenbaum said that, in addition to her, the preschool has another staffed teacher for the 9 students, although several parents contribute what they know to enrich the curriculum and offset the cost of tuition. "We calculate how much work we'll need of the particular skill throughout the year, and pay for it all at once at the beginning by adjusting the tuition fee," Kirschenbaum said. "If applicable, the parent keeps track of hours and shares it on a Google spreadsheet." For full-time care from Monday through Friday, the price is $12,000 annually. Half-day care from Monday through Friday costs $7,700, while part-time with a few select days costs and $7,500. An additional $900 is added if lunch is included, according to the preschool's website. For Anna Pervukhin, mom of four and full-time public defender, the school has provided her with a “massive” break in tuition in exchange for things like baking, photography, art and science support, she said. “Right now, my job is to help grow the science curriculum and procure materials for the science program,” Pervukhin said. Kirschenbaum said the school currently has enrollment for the following school-year has increased to 15, although she's hoping to expand to 25 in the coming years and open a new location in Inwood. "This place is unique," Kirschenbaum said, adding that there are children from all different kinds backgrounds. "We're open and reunited and we're happy."